Jasmine Kumalah is the author of Holding Demons in Small Jars. Born in Belgium to Sierra Leonean and Togolese parents. Brought up in Sierra Leone, lived in Ghana, Togo, Benin and finally settled in the United States of America with a Bachelor's degree in Human Georgraphy and African Studies and Masters in City and Regional Planning. A promising writer to be on the lookout for. Mary Okeke: I really enjoyed reading your book as you might have noticed from my review. A short narrative, however, so rich in content. I read that you are Belgian born, Sierra Leonean-Togolese-American, could you please explain your rich heritage? Jasmine Kumalah: It has always been important for me to honor all the places that have come to make me. I was born in Belgium to a Sierra Leonean father and Togolese mother. After a move back to my father's country Sierra Leone that was interrupted by civil war, my family and I became refugees and ended up in the United States where I became a citizen. 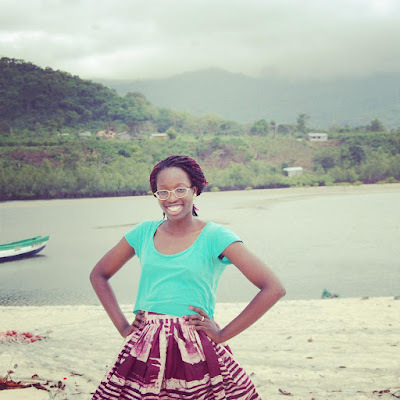 Mary Okeke: Seeing that you have a Bachelor's degree in Human Geography and African Studies and Masters in City and Regional Planning, are you going to pick up writing as a profession? Jasmine Kumalah: I have come to label myself as writer in the last few years. I'm not in a point in my life where I can sustain as a full time writer. But writing is something I take very seriously and I spend a lot of time building myself in the craft. MO: How did you come about writing “Holding Demons in Small Jars”? JK: Holding Demons in Small Jars was a cathartic piece for me. The Sierra Leonean civil war played such an important role in my life trajectory I knew that I had to write back to it. I especially wanted to process what the war had done to me and my community emotionally. What kind of emotional traumas haunt those of us who survived? This was the space the book was birthed out of. MO: How did you decide upon the title “Holding Demons in Small Jars”? May I also ask the figure of speech? JS: I've tried to remember the exact moment the phrase came to mind but I honestly can't remember. I'll like to think it came to me in a dream and I woke up knowing that somehow those words were what encapsulated the book perfectly. Whenever I say the phrase people are arrested by it, it's emotive and visual and it speaks to the discomforts in the novel. The figure of speech isn't one I've ever seen. But for some reason when it came to me it felt like it spoke to what it means to not speak about one's emotional traumas. We all know the phrase about people holding their demons inside. I imagined that demons would be very uncomfortable in small jars, that they would find ways to do some mischief inside of us. MO: Correct me if I am wrong, the fictitious country "Bantunia" in your novel refers to Sierra Leone? JK: Yes, the fictional country is completely inspired by Sierra Leone. While writing the book I felt a lot of emotional blocks when I tried to write about Sierra Leone. At the time that I started the text I hadn't been back in about 13 years. It felt very difficult to write about Sierra Leone given the place it occupied in my mind. It was distorted by time, space and an array of painful and beautiful emotions. Bantunia is the place of my memories, I couldn't in good conscience call it Sierra Leone. MO: Why did you feel like telling this story charged with so much social conscience? JK: The story was personal. When I started writing it I didn't have any publishing intentions. I simply had a story I needed to tell that needed to come out on paper. I know that I was frustrated by the ways in which emotional trauma isn't spoken about in my community. And I was thinking a lot about the ways my life had been affected by the trauma and how emotional trauma on a community level could still be playing out in a country even after the war is over. MO: What message do you intend to send with your story? JK: I hope everyone arrives at their own conclusions. I've had people read into the story in so many different ways I prefer that the text is a reflection of whatever the reader needs to understand from the text. MO: Do you think there is any program available in countries like Liberia and Sierra Leone to help reshape and redesign the lives of children used as child-soldiers, is it successful? JK: I'm no expert on this. I know that there were a range of programs that happened both through international and domestic efforts after the war. When I went back to Sierra Leone I was struck by how many of the "okadas" I saw. And I noticed how many remarks people made about the amount of deadly motorcycle accidents. I know that okada-driving was part of some reintegration programs for child soldiers. It struck me how many were now dying in this other manner. Another thing the book looks at is the tensions that exist between civilians and the child soldiers that have returned. One of my favorite programs I followed was in Sierra Leone and it involved gathering civilians and past rebel soldiers in rural communities. Individuals would admit to their wrongdoings in front of community members and be forgiven. That program which was domestic grown felt incredibly powerful to me. MO: Si jie Loo is your book illustrator, how did you come about working with her? She brought a lot to the story by the way with her ilustration. JK: Si Jie and I are best friends since college. She is a gifted visual artist, dancer and musician. I've always loved her visual language and knew I wanted to collaborate with her somehow. When I was done with the text, an idea came to me that juxtaposing the heaviness of my text with the lightness of her work could be powerful. I reached out to her and she immediately agreed. It was a dream to work with her. 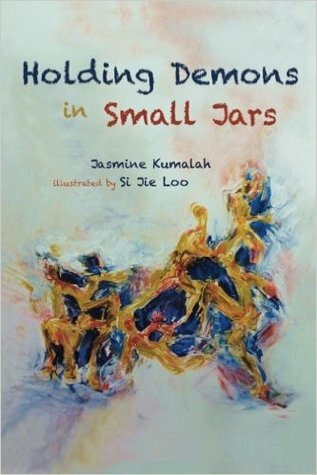 JK: A book like Holding Demons in Small Jars was very much written for my African and African diaspora community. I am very passionate about opening up about our emotional and psychological traumas. I really think some extraordinary healing from both generational and present traumas are needed in order for many of our communities to reach the spaces of success they want to reach. JK: There are some current African writers that are really inspiring me. I love the work of Teju Cole and Taiye Selasi. I also love Warsan Shire's poetry. MO: Are you reading any book at the moment? JK: I've followed the blog for a time as a way of hearing and knowing about work by other African writers. JK: You can purchase the paperback and eBook version through a host of different ways. MO: Thank you very much. Well done, Mary - what an excellent, personalized interview! I had already added Holding Demons in Small Jars to my TBR list based on your review, but now I must star it and move it much closer to the top [where it usually ends up on my TBBought or HaveBeenBought lists ;-)]. Although I'm not part of the African or African diaspora community, I want very much to read this book and hope that it will help me have, not just a greater understanding, but also a greater empathy for my fellow world citizens. Hi Debbie, Thank you for stopping by, I cannot wait to read your thoughts.